One of the biggest concerns in the construction industry is construction site security. With theft and vandalism on the rise, and the need to ensure workers are working hard throughout the day, installing a video surveillance system on a construction site is essential. Security cameras are an efficient way to improve the overall security of construction sites, regardless of the location, size, or the construction phase of the site is. Many construction companies sites have made the decision to integrate security cameras on their sites. Some of these surveillance cameras are monitored live, while others are recording to investigate an event or incident after it has occurred the fact. 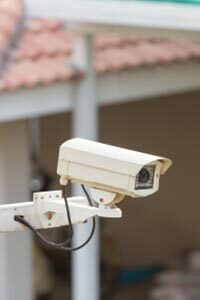 However, many construction sites still do not have a security camera system. Fortunately, whether a construction company is large or small, it’s never too late to invest in construction site surveillance. Since construction site security is a major concern for many companies, we are going to cover how construction security cameras can put a site at an advantage! What is Construction Site Surveillance? Construction site surveillance is the installation of security cameras that enable project managers to monitor an active job site. A network of surveillance cameras can record day-to-day activities at one or more sites and transmit it to a monitor, generally on a computer, tablet, or personal device. These security cameras are an easy way to protect and secure both manpower and expensive materials. In the construction industry, there are two common issues at hand: the loss of time and material. Many sites face a number of security issues. Materials like copper piping, lumber, steel, tools, and other expensive items make construction sites a common target for theft. In addition, accidents, vandalism, and employee distractions can cost sites valuable time. The installation of CCTV security camera systems can make a significant impact. Usually, security camera companies will offer site surveys to determine what is needed for proper coverage. These cameras address many of the issues and concerns in the construction industry. Plus, many insurance companies will offer reduced rates for construction sites that are equipped with a video surveillance system. There are many benefits of construction site security camera installation, some which we touched on above. 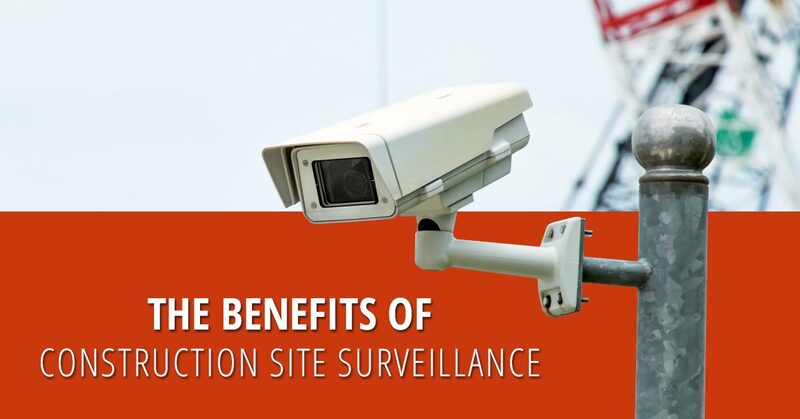 Let’s take a deeper look at some of the main benefits of construction site video surveillance. Given that theft is one of the main issues regarding construction sites, installing a network of surveillance cameras in clear view are a deterrent to thieves. And, if theft were to occur, the proper installation of security cameras would catch the thief in the act and the video could then be used by authorities. Nonetheless, anyone attempting to steal from a construction site will second-guess their choice when they see several surveillance cameras overlooking the area. Many surveillance cameras have the technology to detect site intruders instantly. For example, CCTV security cameras with an IP camera solution can detect motion. This technology sends notifications directly to the site manager on their personal device, identifying the area of intrusion. When site managers view the video, they can then determine whether there is a threat or if it is a false alarm. All the technologies of these security cameras work together to provide the most accurate detection of intruders. Construction is a physically demanding job, and worker safety is a major concern at job sites. On-site security cameras give project managers and safety coordinators the opportunity to monitor workers in order to ensure they are following the proper safety guidelines. In addition, video surveillance can identify areas of improvement where additional training is necessary. Construction sites present the risk of injuries to workers or those passing by the site, which can be a serious liability issue for job site owners and managers. Security cameras can help protect site owners from outrageous workers’ compensation claims and foolish lawsuits. Site project managers and supervisors cannot always be at the construction site to monitor each and every worker throughout the entire day. However, with construction site security cameras, a review of live and recorded surveillance camera feeds enables them to target specific areas on the construction site to determine if everything is going smoothly. Many companies will choose construction site security camera rentals for their projects. Having these mobile units on site gives project managers the ability move the cameras as the construction phases progress, ensuring complete coverage of the site. That’s what makes construction security cameras so great! When using surveillance cameras and assessment technologies, the chances of an on-site apprehension are much better. When you have all this at hand, it often results in a higher prosecution rate. Authorities will respond with higher priority to video breaches, giving them more time to catch the thief in the act. There are plenty of additional benefits that come with construction site security camera installation. Overall, the addition of video surveillance improves the safety and security of construction sites. Do You Need Construction Site Security in Colorado? Did you know that Colorado is one of the top states with the most construction equipment theft? Thousands of claims are reported every year due to theft, vandalism, trespassing and other criminal acts on construction sites. When project managers are ready to protect their site with video surveillance in Colorado, they need to contact the team at Visual Security! Visual Security is the leading seller of construction site security cameras in Colorado. Contact us to schedule a free site survey!